The rockabilly all starS aka buddy holly live! Most recently performing as The Rockabilly All Stars and before that as Rockabilly Riot, Buddy Holly Live! has been playing soft-seaters and performing shows to packed houses across Ontario since 1999. The band re-enacts a 1958 early rock n roll, rockabilly style show as it would have been performed by Buddy Holly and the Crickets. "The accents, the mannerisms, the costumes and the instrumentation are all impeccable says Rick Nelson, radio personality. The energy is contagious and the response from audiences has been unanimous - standing ovations and singalongs. Buddy Holly Live! 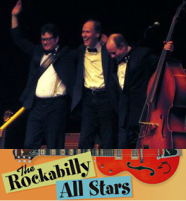 & the Rockabilly All Stars are based out of Kingston Ontario and perform a show that is a blend of rockabilly music and musical theatre with a comical undertone very much like Holly himself at live shows between 1955-1959. Buddy and the Crickets tell the story of what it was like to get to the top of the charts during the late 1950's while being barely 21 years of age. Their music has changed the world and these boys share it in a way that engages, informs and thrills. Since 2015 they have been playing as The Rockabilly All Stars to solid reviews. Their expanded repertoire includes songs from Buddy Holly played with impeccable attention to detail - as well as other great rockabilly artists of the era and some modern ones including The Stray Cats (Brian Setzer), Ritchie Valens, Carl Perkins, Eddie Cochran, Elvis, Louis Jordan, Robert Gordon, Ronnie Dawson. Wrap them all up and you get the Rockabilly All Stars' Texas Twang style. A blend of swing, rockabilly, bebop, jazz and rock n ' roll into a more modern form of ROCKABILLY that is highly entertaining and great dance music! See UPCOMING SHOWS for where to find the band! Buddy Holly & The Rockabilly All Stars wish to thank the venue organizers and the people who come to see us at these recent shows - Thank y'all!